We have so much to share this month. The Keystone XL pipeline victory was huge. What an incredible moment in the transition away from fossil fuels. We celebrate the groundswell of people who came together to make that happen. Many of us were part of that fight. But like the mythic Hydra, permits to frack gas, mine tar sands, and build more pipelines just keep coming; for every one proposal stopped, another two spring up in its place. State borders do not bind the impacts from these projects. The Dakota Access Pipeline Project (the red line on NRDC's map) would cross four states carrying fracked oil from the Bakken oil reserves to Patoka, Illinois, giving access by rail or pipeline to carry the Bakken crude to the Gulf Coast for refinement and export. The pipeline would be 1,134 miles long, 30 inch in diameter, 24 to 48 inches underground, and would transport 570,000 barrels daily (similar to the now-vetoed Keystone XL pipeline in brown). 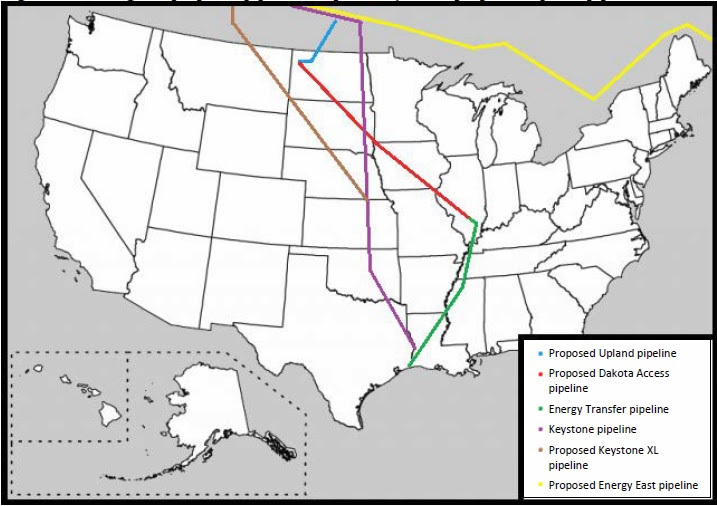 The Upland Pipeline (the blue line) would be an extension of the Bakken pipeline and connect it to the tar sands in Canada, thus making the two pipelines essentially a Keystone XL bait and switch. A lot of superb organizing here in the U.S. has focused on stopping the construction of new oil infrastructure for transporting more of Canada's tar sands crude from Alberta to the U.S.
What many people do not realize is that we have our very own tar sands (and oil shale) right here in the U.S. In fact, the oft overlooked state of Utah has the largest oil shale deposits in the world -- with estimated barrels of oil far exceeding Saudi Arabia's known oil reserves. And the first U.S. tar sands mines are being built right now, making Utah ground zero for the fight against tar sands and oil shale production here. There is a key difference between the Keystone XL pipeline and projects like the Bakken pipeline or the tar sands mining in Utah. In the battle over Keystone, there was an agency and a President to target. These other projects are more diffuse. Decisions are happening in county and utilities board hearings. Organizers are tasked with navigating a disjointed and broken regulatory system that's been created out of the tangled web of private, local, and state interests. It's difficult to create a coordinated and effective defense of the land. How then do we fight against this fossil fuel beast, with its many bureaucratic heads, fed on antiquated subsidies and carefully tended by corporations and the status quo? We change the rules of the game. In the face of such stiff-necked, rubber-stamping officials, the climate justice movement is beginning to organize like the pipelines themselves -- locally and also as an interconnected, transnational front with a common agenda to keep fossil fuels in the ground. Recognizing that the game is rigged, communities are looking for different ways to intervene in the decision making process. This is where SEHN comes in. SEHN is participating in grassroots coalitions from the West Coast to the Rocky Mountains to the Midwest, bringing new strategies and analysis to support local efforts to stop noxious facilities of all sorts. We have developed legal principles and community tools designed to stop climate change at its source – energy extraction. These principles break open points of intervention to better protect public health and the environment, and put civic engagement back into the hands of community members who are the true stakeholders of the land, water, and air they wish to protect. How is SEHN changing the rules of the game? This month for the first time, future generations will be represented in an executive branch hearing. SEHN is doing this; we are intervening on behalf of Future Generations. But we do more than just work out legal frameworks. We are joining the legal frameworks with the grassroots organizing -- the principles emerge from those engagements to better serve local needs. Together with the strength of advocates across regions, we are facing the Hydra. And we're changing the narrative. These issues are complicated, and they are affecting our environmental and public health. As Science Director Ted Schettler pointed out at SEHN's recent event in St. Paul on the Ecology of Breast Cancer, "it can result in throwing up your hands and feeling a lot of despair." But, he says, "there's a lot of good news [too]...there's actually reason to think we can take this theoretical complexity and say, "what I can do on the ground, in my community, next week" to try and address this problem." 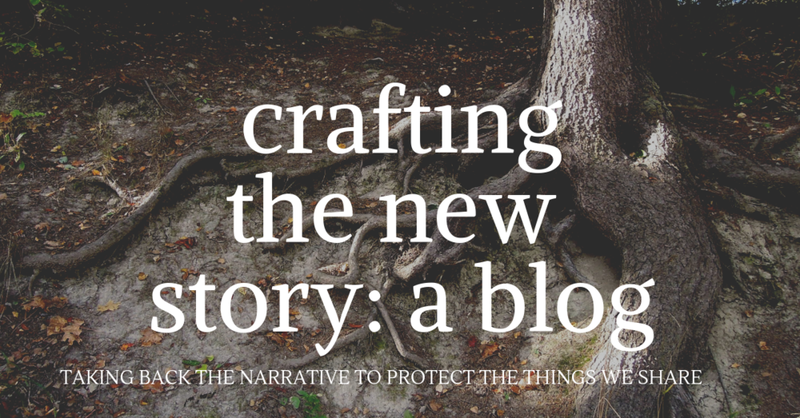 Advocates like SEHN's board member Angie Carter are also welcoming the complexity and working with communities to break open the space for activism by finding the shared values across community stories. In our conversation she captures SEHN's own belief in the power of community: "community is what’s so powerful to me — communities that have the power to help shape their future." We are not just the consumers of a system, "we are the makers of it". We participate in community conversations about environmental health because, as Carolyn Raffensperger put it at the recent event in St. Paul, "the work of SEHN is to prevent suffering...if we can prevent suffering than we will do so." And we participate in grassroots coalitions with the assumption that if we can stop a multi-state pipeline in one jurisdiction, we can possibly stop the whole pipeline; and if we can stop one pipeline, we are more likely to shut down tar sands and fracking for gas and oil. If we can shut down a tar sands mine or fracking operation, then we are one step closer to avoiding climate catastrophe. The work is hard. But people are rising up on behalf of their communities, for environmental health, and for future generations; something beautiful is growing. P.S. None of this work would be possible without your support. Please consider donating to SEHN today! "The Bakken Pipeline Resistance Coalition (BPRC) and Iowa Citizens for Community Improvement (Iowa CCI) celebrate the State Department and President Obama’s decision to reject the Keystone Pipeline. This decision demonstrates political courage and environmental wisdom by recognizing that fossil fuels need to stay in the ground. There is no safe way to transport these hazardous chemicals, whether it is by rail or by pipeline. For this reason, it is time to reject similar pipelines proposed to transport oil from the region of North Dakota and Alberta Canada." Follow the Coalition's activities here. SEHN's Carolyn Raffensperger will testify at the upcoming evidentiary hearing that begins Nov. 16th with the Iowa Utilities Board. This hearing is important because the Bakken Pipeline is designed to replace Keystone XL (read more). It is also unique because,for the first time, future generations will be represented in an executive branch hearing. SEHN has been granted intervenor status to intervene on behalf of future generations. Read Carolyn's testimony here. Visit SEHN's website for more testimonies. On Tuesday November 17, the Bureau of Land Management is planning to auction leases on over 74,000 acres of Utah lands to oil and gas exploration - at a time when we desperately need to keep oil and gas reserves in the ground to prevent catastrophic climate change. Elders Rising is a informal group of seniors who are concerned about the future for their children and grandchildren. Vaughn Lovejoy from Elders Rising explained "We will be there to call upon our generation, who came of age in the sixties, to reawaken and fulfill the dreams we had to create a better world. It is time for us to become true elders in its traditional and deepest sense and act as visionaries and guardians on behalf of the coming generations." Elders Rising will be joined by the Rainforest Action Network, and WildEarth Guardians and Center for Biological Diversity. Visit the FB event page for more information. Read one organizer's call to the older generation to stand for a brighter future -- for intergenerational justice. This December, the Conference of the Parties (COP) to the United Nations Framework Convention on Climate Change will meet in Paris for their 21st annual meeting. This conference is pivotal in making global agreements to avoid dangerous climate change. Yet many people do not know what the COP is or why this 21st meeting is so important. SEHN celebrates actions that aim to bridge science with law, policy and ethics for the public. That is why we are excited to share this work from some of our allies in the climate justice movement. Visit our website to learn more. In a conversation with Kaitlin Butler, SEHN's board member and co-founder of the Bakken Pipeline Resistance Coalition, Angie Carter, speaks about what it was like growing up during the 1980s Farm Crisis in Iowa, the impact it had on her work to capture more representative narratives, the power of story, and how she found herself helping to build a movement. Read our conversation here. Utah is home t o the largest oil shale deposits in the world. The oil locked away in the Green River Formation is three-times Saudi Arabia's known reserves. SEHN's Kaitlin Butler recently attended the 35th Oil Shale Symposium in Utah. Read her article published for DeSmog Blog on Utah's Oil Shale hopes and the industry's "PR Problem". Tom Goldtooth, Executive Director of the Indigenous Environmental Network has been awarded the Gandhi Peace Award for his incredible work in environmental and economic justice and the many environmental actions to protest destructive projects like the Keystone XL pipeline, Oak Flat, and the toxic goldmine spill earlier this year. View his acceptance speech here. On October 21st Carolyn Raffensperger and Ted Schettler spoke to a crowd of 50+ people in St. Paul on breast cancer, scientific uncertainty, and the rise of women's activism. The Ecology of Breast Cancer, written by Dr. Schettler, is a book exploring the origins of breast cancer and improvements in treatment outcomes using SEHN's ecological framework of health and disease. The evening ended by talking about the idea from Wendell Berry that "health is wholeness" and that our membership in a particular community is a key determinant of our health. Conversations like these are just the beginning of our work to integrate action on climate change, the transition away from fossil fuels and creating healthy, toxic-free communities all over this country. The origins of many common diseases and disorders are complex. An ecologic or eco-social framework recognizes that individuals are progressively nested within families, communities, ecosystems, and societies. This framework is not only useful as an aid to understanding the origins of complex diseases but also helps point the way toward treatment and prevention. Join SEHN's Science Director, Ted Schettler, MD, MPH, and Michael Lerner, PhD, President of Commonweal, as they explore the implications of the ecological framework of health as it relates to several diseases that are common in our families and communities today. Thanks for sharing in our excitement around this challenging, important work. We welcome any comments or suggestions for future Networkers at moreinfo@sehn.org. Standing with Future Generations - Join Us!